How did Formula E come into being, what are the business relationships between Formula E and the teams, or Formula E and host cities, and just how did Formulec get to be the provider of cars to Formula E? 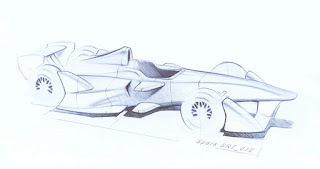 Those questions and others are covered in an article in Square Mile Magazine, that was the source for the previous post about Formula E looking to add Monaco to the 2014 schedule. Alejandro Agag is a businessman, and active in the world of Motorsports. For example he owns a racing team in a Junior series to the Formula 1. When he married a relative of the former Spanish Prime Minister, the wedding was attended by the likes of Tony Blair and Rupert Murdoch, indicating that he is one of the Elite. Formula E is entering a sphere where the gasoline-powered game is incredibly expensive. For example cities that host Formula 1 races pay a "hosting fee" to Formula 1 of £18 million, and fans are paying perhaps £110 for a three day pass to see the full weekend. Big money, and gives a sense of the challenge Formula E faces in getting itself established. For what it's worth, the TTXGP has faced a similar challenge in electric motorcycle racing, and was trying to establish itself without the support of the equivalent organization (FIM), and has recently been able to negotiate a deal with the FIM. How did Formula E and the folks at Formulec get hooked up? 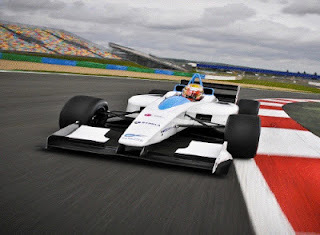 Agag heard of Formulec, and the article describes that company as the makers of the "first prototype single seater full electric race car." The people at Kleenspeed or Drayson Racing might quibble with this, but there's no arguing that Formulec was a pioneer in this field. In any case Agag got investment money from a Spanish real estate developer and bought Formulec for an amount in the tens of mullions of dollars US, under $100 million, while ensuring that the Formulec team stayed on board. The purpose of buying Formulec was to give Formula E credibility, and to give the teams a car to drive. 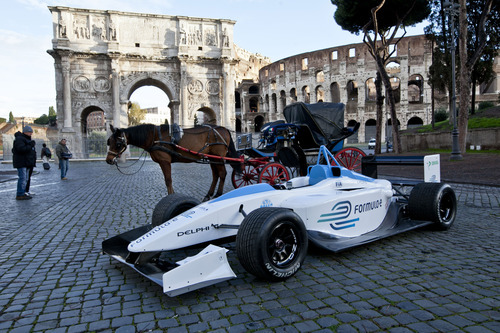 What they've developed is a Formula-style racing car, electrically powered, with a top speed around 150 miles/hr. To put that into perspective, the Detroit Electric sports car just announced is claimed to have a 155 miles/hr top speed, and at the 2012 TTXGP World Championship the Brammo Empulse RR's were hitting 170 miles/hr in racing conditions and could possibly have gone a bit faster if the controllers had been less wonky at that speed. The business arrangement between Formula E and host cities is different than it is for Formula 1. Rather than demand a large fee, Formula E asks for $0 in fees, but requires that the city provide the best position in the city, introductions to local sponsors etc, and provide police and infrastructure assistance. Hence, the host cities are ponying up some resources but not monetary ones. Where Formula 1 races last 90ish minutes, the Formula E cars have battery pack capacity for 25 minutes of racing. To get around that the racers will have two cars apiece - two racers per team - for four cars per team. The race format includes at least one phase (should be three or four phases) where the racers switch from one car to the second car. To make that switch, the racer parks the car in one spot, then has to run 160 meters to where their second car is parked. The Square Mile article does not say this, but if they want the Formula E race to follow the format of Formula 1 races (be the same total length of time) it will mean more than one car switch. To last 90 minutes with cars that have 25 minute capacity means three switches between cars, and each car is used twice. That in turn will mean a complete recharge within 25 minutes. And that in turn means some sort of fast recharge capability. That will either mean a fast battery swap, or actual fast recharge. FWIW, Drayson Racing has been experimenting with the Qualcomm Halo wireless fast recharge system. During a race each car will have "access to three power boosts" and a fourth "power boost" will be granted to the driver who gets the most number of telephone votes during a race. There will be a Formula E video game that will offer a unique feature - the ability to compete in the race online while the actual race is running. The prize fund will be £330,000 ($500,000) per race giving a total of £3.3m ($5m) per year. Another way Formula E diverges from Formula 1 is in the cost of participation. Formula 1 teams build their own cars and also have a large staff, sometimes 600 people. It's thought the annual budget for a Formula 1 team is £120 million. Formula E is providing teams with cars, though teams have the right to build their own if they choose, on a lease basis, and Formula E rules also limit the number of people who can be at the race thereby limiting the size of the team. It's thought the per-team budget will be on the order of £2 million.